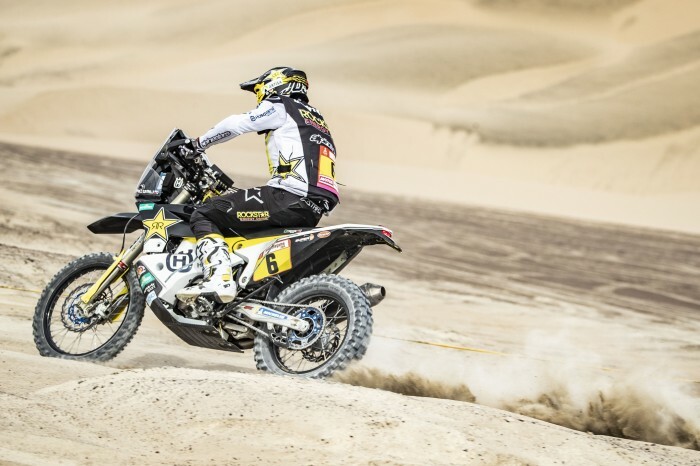 After battling his way through a tough stage four of the 2019 Dakar Rally, Rockstar Husqvarna’s Pablo Quintanilla is holding on to a strong runner-up position in the event’s provisional overall standings. Four days into the 2019 Dakar and the event in Peru has already proven to be a big challenge for all competitors. Thursday’s stage four was a fast-paced one that featured many tricky navigational challenges. Quintanilla battled through the day’s tough navigation to post the 14th best time on the special stage. Currently second in the provisional overall, the Chilean is now two minutes and 19 seconds behind provisional overall leader Ricky Brabec. “It was a really hard stage today. The first part had some tricky navigation in the fesh-fesh. In the last waypoint before the refuelling I made a mistake but was able to get back on the tracks quickly,” said Quintanilla. “Then after the neutralisation point the tracks were really hard. There was a long dry river bed with many stones and it was hard to make some time. I knew from the beginning of the stage that it was possible to get caught by other riders and when it happened I just tried to ride with them.